For a facility named the War Room, it is awfully quiet and calm. 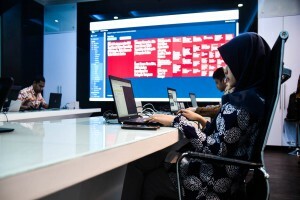 It’s where a team of young Indonesians troll the web for the fake and flagrant. As the nation approaches the presidential election on April 17, the ministry’s team has seen an exponential increase in online trickery. Riko says they have seen a 30 per cent spike in politically-related hoaxes this year. Facebook has enormous influence in Indonesia with more than 130 million users; it is one of the social media giant’s largest markets in the world. And its platforms, including WhatsApp and Instagram, have been fertile ground for the spread of misinformation. As a result, Indonesia has become a key focus for the company. On April 12, it announced it had removed 234 accounts “for engaging in coordinated inauthentic behavior”. Harry Sufhemi is the co-founder of Mafindo, a community-led INGO that relies on the public to take down fake news. He has only five fact checking staff but leads 60,000 online members to tackle hundreds of different potential hoax campaigns. Mafindo runs with a doctrine to “defend, detect and counter”, and at its core, it wants to ensure civilians are armed with the awareness and tools to stave off the deceptions of hoax producers.